Interior of Fort George, Ontario. 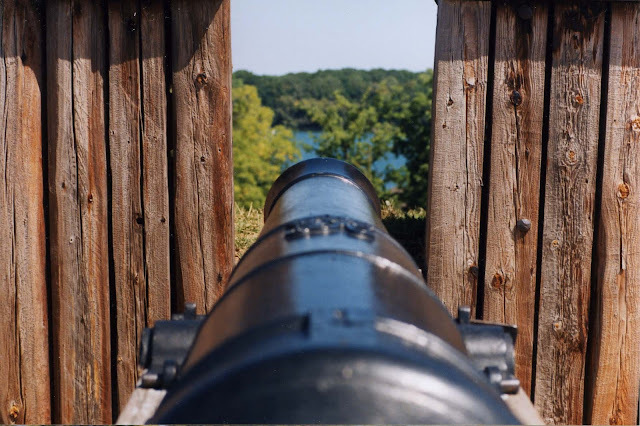 A gun port. The only thing most Americans know about this war is the year it began. Brochures for War of 1812 sites in Canada. Two of the very few juvenile series books set during the 1812 war. 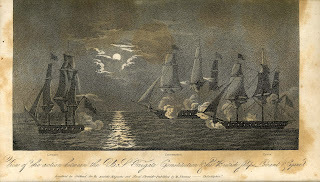 The year 2012 marked the bicentennial of this second war with England, (although most of it took place in 1813 and 1814.) Because of coincidental timing, celebrations of the 1812 war have been overshadowed by Civil War memorial events, yet despite the superficial treatment of this footnote to the titanic European Napoleonic struggles, the war had profound implications for the survival of the fledgling republic. 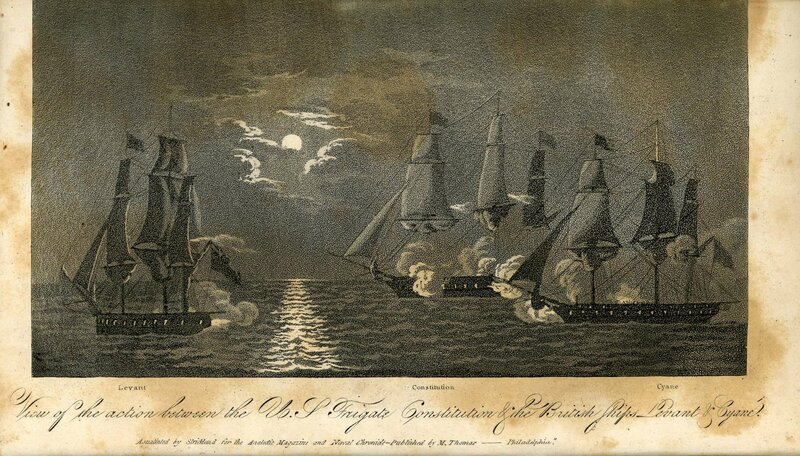 The young United States came very close to defeat and possible re-absorption into the British Empire. 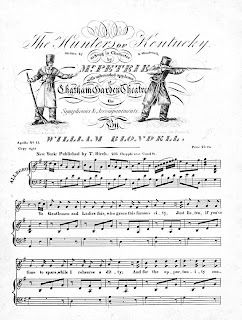 The stirring and almost un-sing-able U.S. national anthem, “The Star Spangled Banner” (now regularly butchered by celebrities at sporting events) came out of this bitter conflict, along with a nativist political legacy of hatred for all things English. 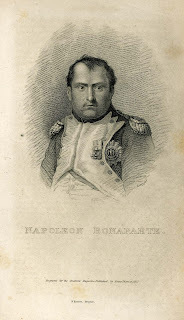 Portrait of Napoleon Bonaparte, engraved by William Satchwell Leney (1769-1831) for The Analectic Magazine, 1817. Like the struggle with Mexico in 1846-48, the Korean and Vietnamese police actions, and the U.S. interventions in the Balkans, Somalia and Iraq, the 1812 war was unpopular from the outset. 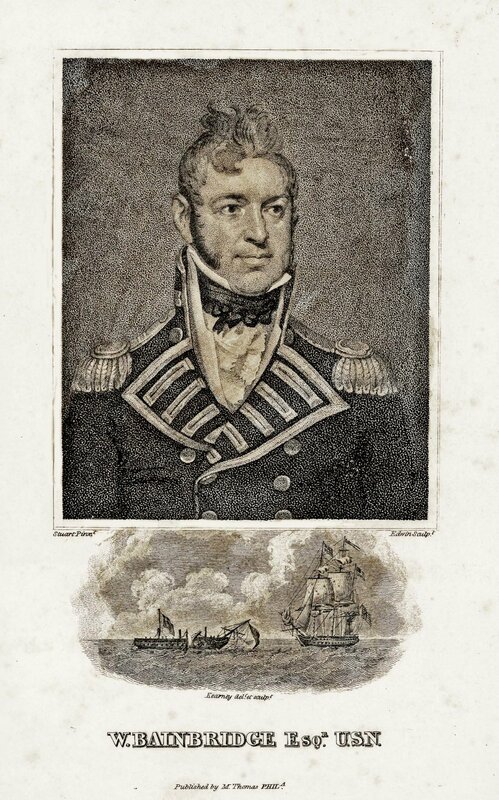 Beginning in 1807, escalating incidents involving American and British ships had repeatedly put both nations on the brink of armed conflict, but cooler heads defused the tensions. 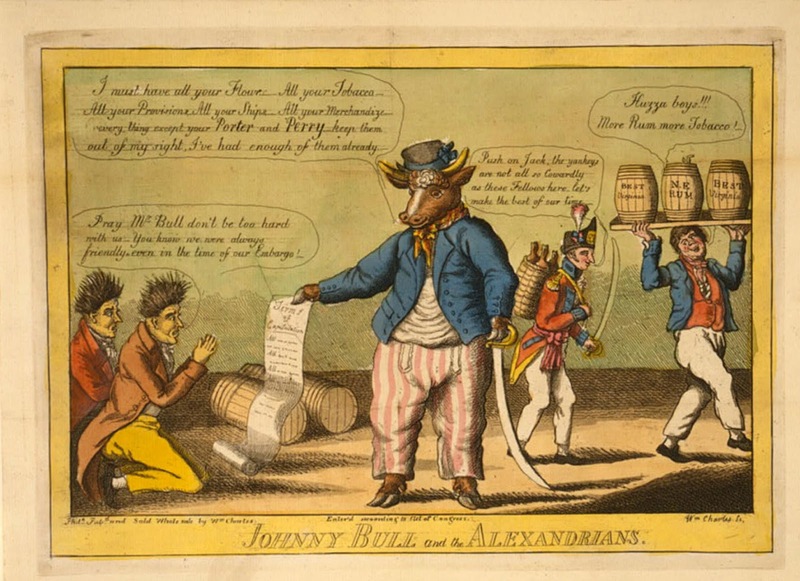 The series of wars between Britain and Napoleonic France brought economic matters to a head. In his Berlin and Milan Decrees, Bonaparte imposed sanctions against trading with England. 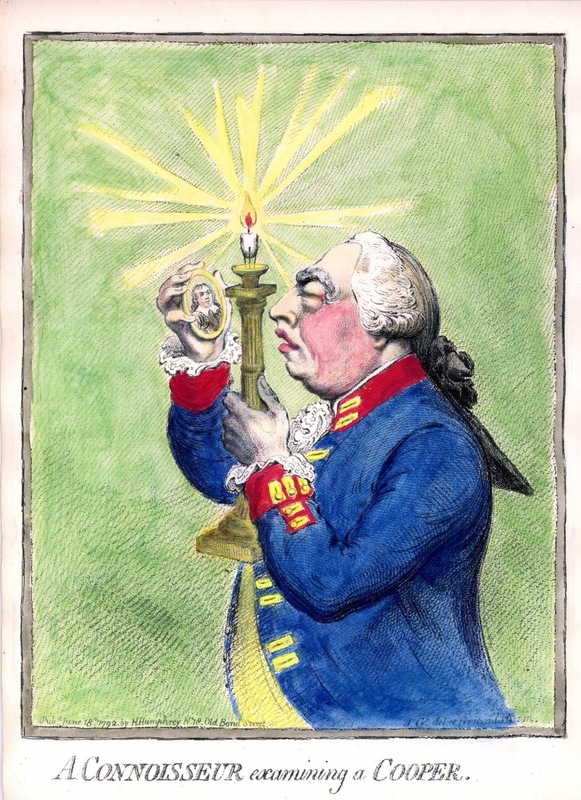 In retaliation, Parliament passed a series of Orders in Council, designed to thwart Napoleon’s international trade, incidentally restricting American commerce. A coterie of “War Hawks” in Congress agitated for redress through armed retaliation. Caught in the middle, the U.S. Congress enacted and repealed several trade embargoes against the belligerents. Hoping to avoid a second front in the ongoing war with the French Empire, Parliament repealed the Orders on June 16, 1812, but it was too late. President Madison had asked Congress for a declaration of war on June 1. The House of Representatives voted 79-49 in favor of war, and the Senate concurred with a 19-13 vote. Once again, slow overseas communications had foiled diplomacy. 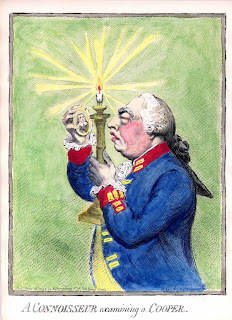 “A Connoisseur Examining a Cooper,” 1792 caricature of England’s George III by James Gillray (1757-1815). 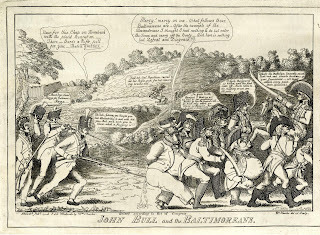 Despite a total commitment to the defeat of Napoleon Bonaparte in Europe, England diverted some of its top commanders and seasoned troops to America to deal with the crisis, hoping to quash it quickly. Opposing these hardened veterans was a tiny and poorly coordinated regular army, an even smaller navy, an inadequate munitions industry and an unreliable mass of common militia. After Napoleon’s defeat and (temporary) exile to Elba in 1814, England could concentrate on crushing the upstart United States, and sent powerful reinforcements to accomplish that aim. 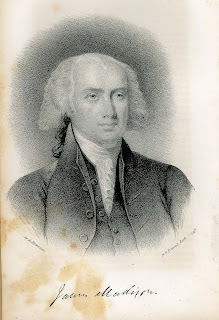 Portrait of U.S. President James Madison (1751-1836) drawn by Albert Newsam (1809-64); engraved by Philadelphia lithographer Peter Stephen Duval (1804/5-86). It was a particularly nasty and inept war in which U.S. troops repeatedly invaded Canada along the Niagara frontier and the Great Lakes. 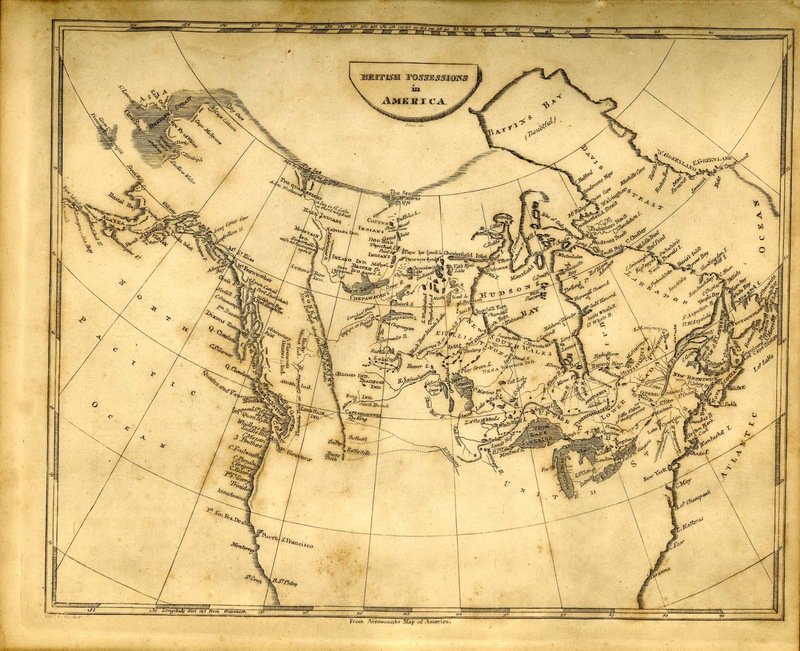 Canada, “the fourteenth colony,” had been a coveted prize during the Revolutionary War. Undeterred by failure in 1775, many in government viewed the new conflict as a golden second chance to grab territory north of the border. After twenty years of peace, the U.S. Army was in a disgraceful condition, led by politically ambitious hacks, and unequipped for combat. A confederation of northwestern tribes, led by the charismatic chief Tecumseh, cast their lot with the British. Crown forces, Canadian militia and Native American auxiliaries, led by the brilliant General Sir Isaac Brock, crushed an invading U.S. army during the Niagara campaign. Detroit had already surrendered to a much smaller British force. Brock’s death in battle at Queenstown Heights gave the U.S. some breathing room, but the land war continued to produce costly defeats. The few American victories were generally inconsequential. 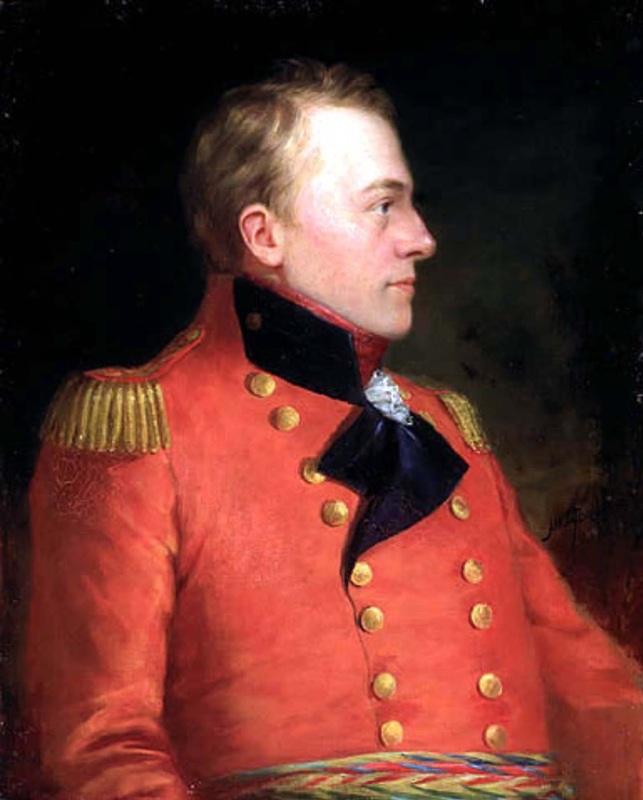 General Sir Isaac Brock (1769-1812). Portrait attributed to William Berczy (1744-1813), ca. 1808. 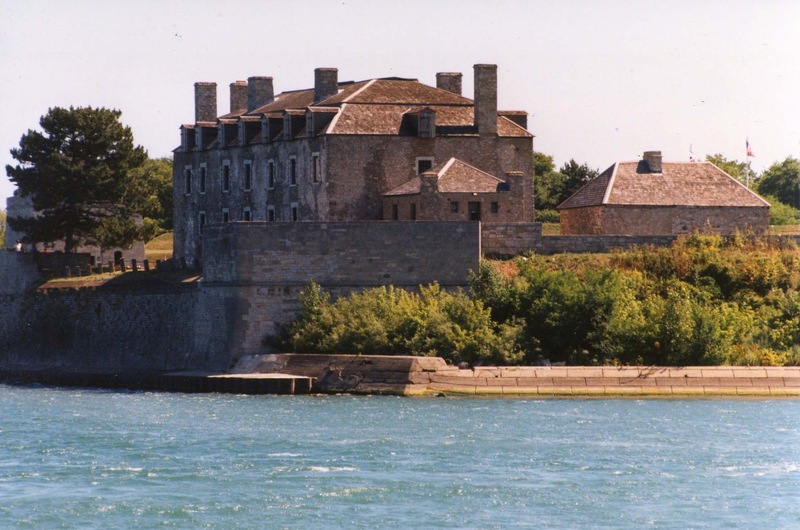 At Lake Ontario, Forts George (British) and Niagara (U.S.) changed hands briefly. 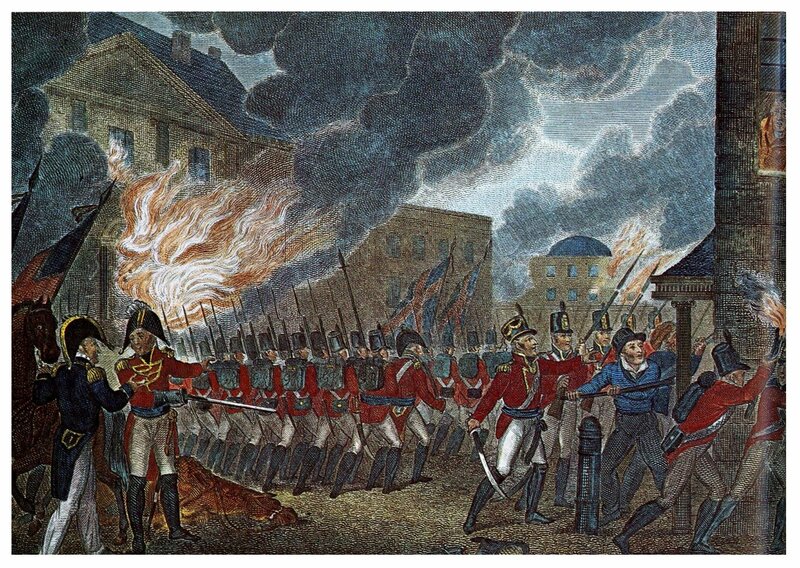 York (Toronto), the capital of Upper Canada, and Newark (Niagara on the Lake), the former capital, were occupied and burned. 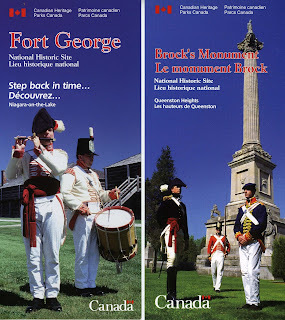 Both these towns had been founded under the Lieutenant-Governorship of John Graves Simcoe (1752-1806). 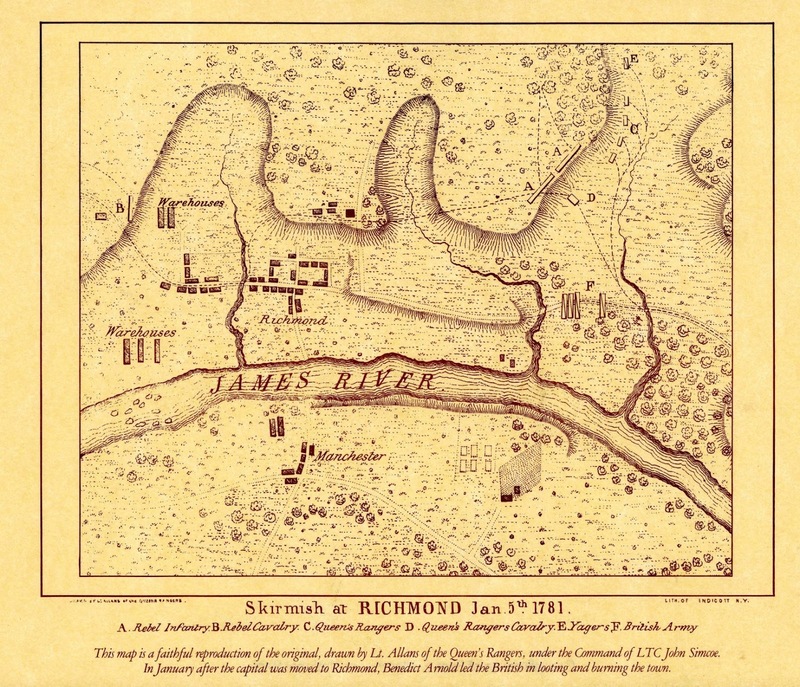 As Lieutenant Colonel of the Queen’s Rangers in January 1781, under the command of renegade Benedict Arnold, Simcoe's men had burned Richmond, the new capital of Virginia. (At the time, some saw the destruction of York and Newark as retribution.) In October 1813, a tiny force of French-Canadian regulars repulsed an American army outnumbering them four to one at Chateauguay, Quebec. Bands of British regulars and their Native American allies raided western settlements from Detroit to present-day Mississippi. 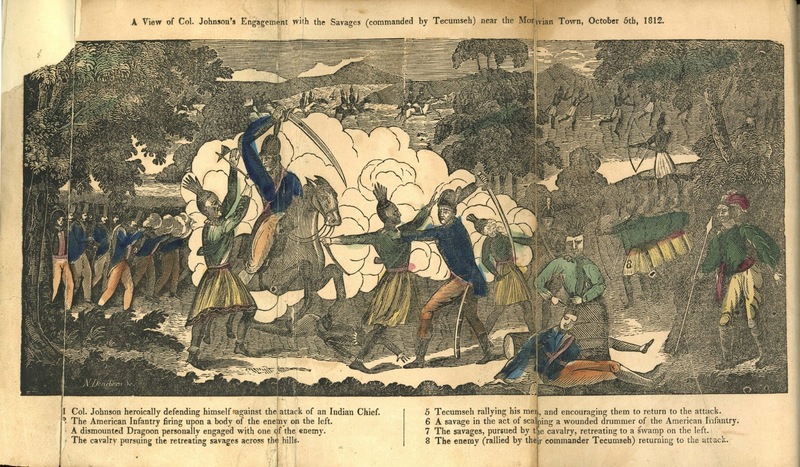 And a secondary war with the Red Stick Creek Indians of the Southeast erupted in 1813, diverting scarce manpower from a major British threat along the east coast. Map of “The British Possessions in America,” from A New and Elegant General Atlas, published in May 1812 by Thomas and Andrews of Boston, Massachusetts. Old Fort Niagara, facing Fort George across Lake Ontario. 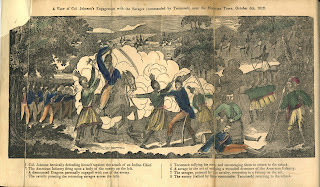 The Death of Tecumseh at the Battle of the Thames, October 5, 1812. From Henry Trumbull’s History of the Discovery of America, of the Landing of our Forefathers at Plymouth, and of their Most Remarkable Engagements with the Indians… Boston, Printed by Stephen Sewell, 1819. After the raid on Hampton, during which the occupying troops and sailors committed atrocities against the civilian population, Cockburn’s force sailed out of the bay and attacked the Carolina coasts. By April 1814, he was back in the Chesapeake, to soften up the region for a full-scale invasion. President Madison and his cabinet underestimated the threat and the defenses around the District of Columbia were entrusted to militia and a few regular troops. These were swept aside by a determined force under General Robert Ross that advanced on the capital and entered the city on August 24. 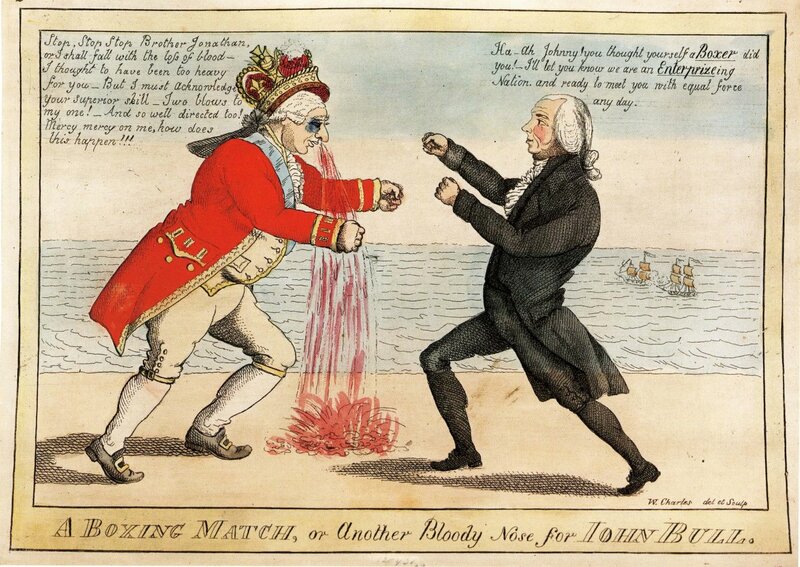 “A Boxing Match, or Another Bloody Nose for John Bull.” Cartoon by William Charles (1776-1820). The federal government fled into the Virginia and Maryland countryside, attempting to reach safety and rally the militia, while raiding parties torched many of the public buildings in Washington, D.C. (The presidential mansion, already dubbed the White House, had to be rebuilt and repainted to hide its scorched exterior.) First Lady Dolley Madison managed to save the mansion’s silverware, but left the actual rescue of Gilbert Stuart’s portrait of George Washington to Paul Jennings, a teenaged slave, who succeeded in his task of unscrewing its heavy frame from the wall. 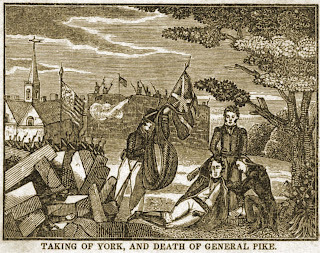 Taking of York, and Death of General Pike. Modern Toronto was named York first; General Zebulon Montgomery Pike died April 27, 1813. The Library of Congress and much of the Capitol lay in ruins. 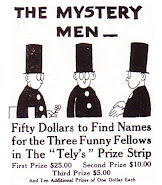 Only the Patent Office was spared through the efforts of Superintendent of U.S. Patents, Dr. William Thornton, who convinced the officer in charge that burning the patents and models would be an act of barbarism against human progress. After the British left, he had to organize a special guard against home-grown looters. Nature, rather than U.S. arms, finally slowed the British juggernaut. A super cell storm, spawning tornadoes, scattered Cockburn’s force. Ironically, the storm destroyed more public and private property than the enemy. 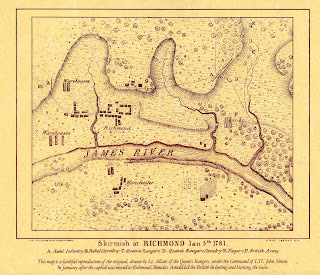 The Skirmish at Richmond, VA, January 5, 1781. Map drawn by an officer in John Graves Simcoe’s Queen’s Rangers. Icy rain cracked the hot walls of the smoldering Capitol and president’s house, damaged the roof of the Patent Office and flattened scores of homes and public and commercial buildings. 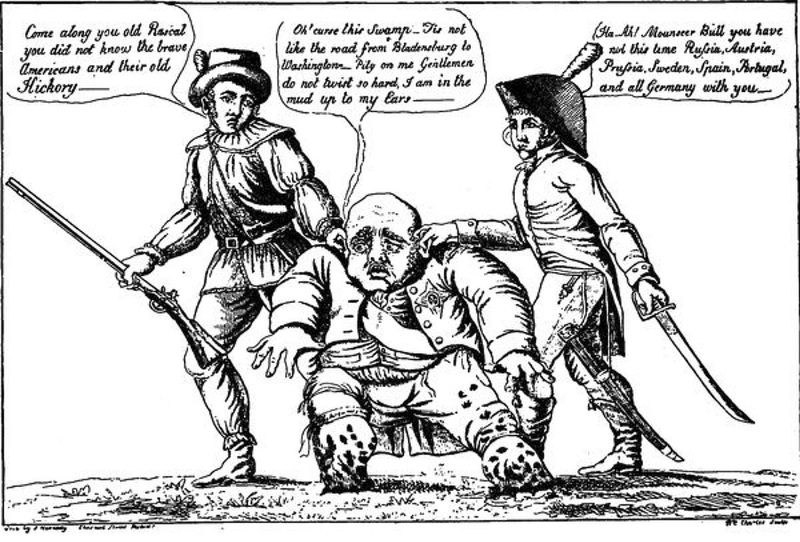 At the end of the war, Cockburn and others tried to justify the burning of Washington as a reprisal for the burning of York and Newark, but this seems unlikely in view of the general policy of creating as much confusion and humiliation as possible. 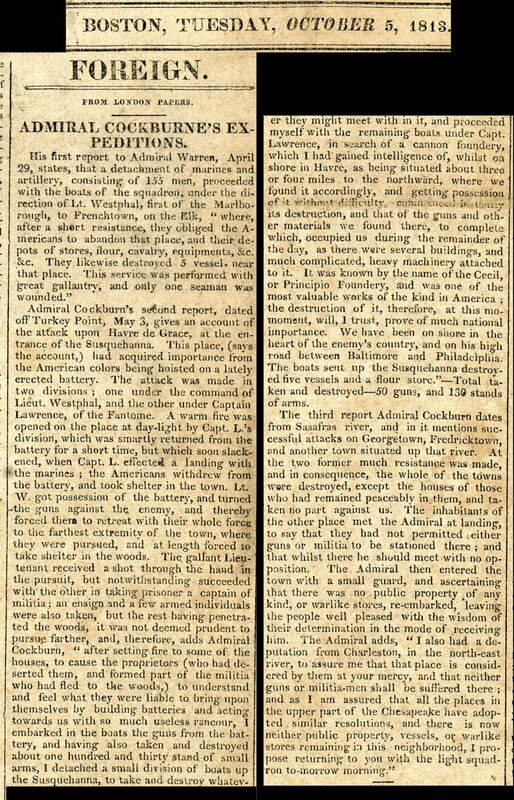 News item describing the “Awful Massacre” at Fort Mims, Alabama, from the New-England Palladium, Boston, October 8, 1813. The success at Washington would not be repeated, however. 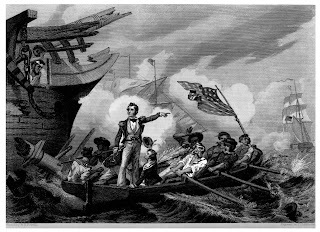 Alexandria paid a ransom to be spared and Baltimore stoutly resisted the naval bombardment, giving rise to Francis Scott Key’s poem Defense of Ft. M’Henry, later to become the U.S. national anthem. The Chesapeake raids came to an end as most of the British forces were transferred to the New Orleans campaign in October. The Battle of Lake Erie, September 10, 1813. A romantic 1858 Engraving by Alonzo Chappell (1828-87) showing Commodore Oliver Hazard Perry (1785-1819) transferring his command from the disabled Lawrence to the Niagara. Although the American Republic’s over-reliance on unprofessional militia jeopardized the land war, outstanding shipbuilding and superb seamanship defeated the Royal Navy in several major engagements at sea and on the Great Lakes. For the first time, the U.S. became a recognized naval power in international maritime affairs. American warships, such as the U.S. Frigate Constitution were so respected and feared that British captains were forbidden to engage them in single combat. The Lake Erie victory, described in the New-England Palladium, Boston, October 1, 1813. 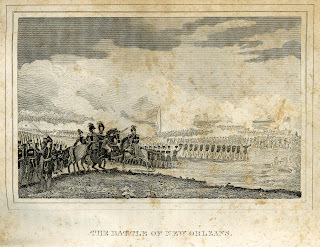 Andrew Jackson’s decisive land victory on January 8, 1815, over General Sir Edward Pakenham at Chalmette, near New Orleans, occurred two weeks after the signing of the Treaty of Ghent, which ended the war. 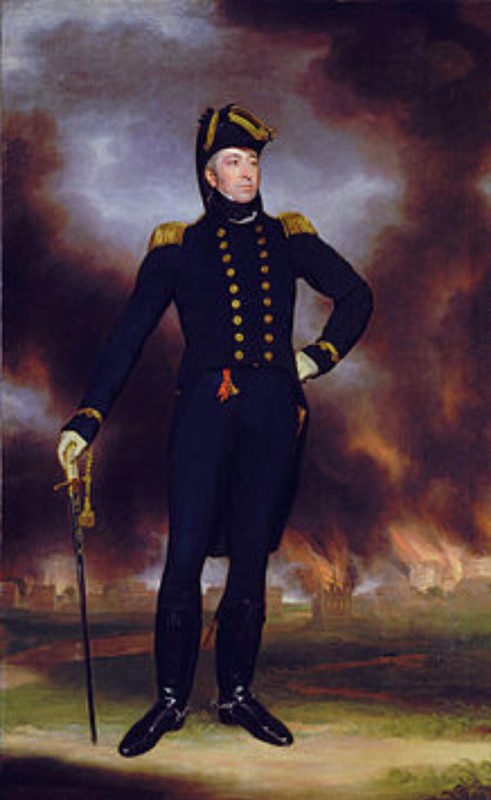 Pakenham, the Duke of Wellington’s brother-in-law, was killed during the engagement. The peace treaty essentially restored the status quo ante bellum in terms of territory and trade agreements, but the U.S. was no longer regarded as an inconsequential confederation of ungrateful ex-colonies. 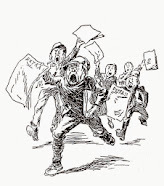 The communications lag caused the news of the New Orleans victory and the peace treaty to arrive almost simultaneously and foster the myth that Americans had “whupped the bloody Brits” a second time. “Another Victory” and Canadian news from the New-England Palladium, Boston, October 1, 1813. Watch an excellent PBS documentary on the War of 1812 HERE. Future military and political giants like Winfield Scott, Andrew Jackson, William Henry Harrison, Sam Houston and Henry Clay all began their rise during the years 1812-14. Commodore Matthew C. Perry, who forcibly opened Japan to western influence in 1854, and Admiral David Farragut, who led the Union navy to victory during the Civil War, commenced their careers as teenaged midshipmen during the 1812 war at sea. David Crockett — frontiersman, politician and hero of the Alamo — served briefly under Andrew Jackson against the Red Sticks. “View of the action between the U.S. Frigate Constitution & the British Ships Levant & Cyane.” Aquatint by William Strickland (1788-1854) for The Analectic Magazine and Naval Chronicle, by Moses Thomas, Philadelphia, 1816. Commodore “W. Bainbridge, Esqr. 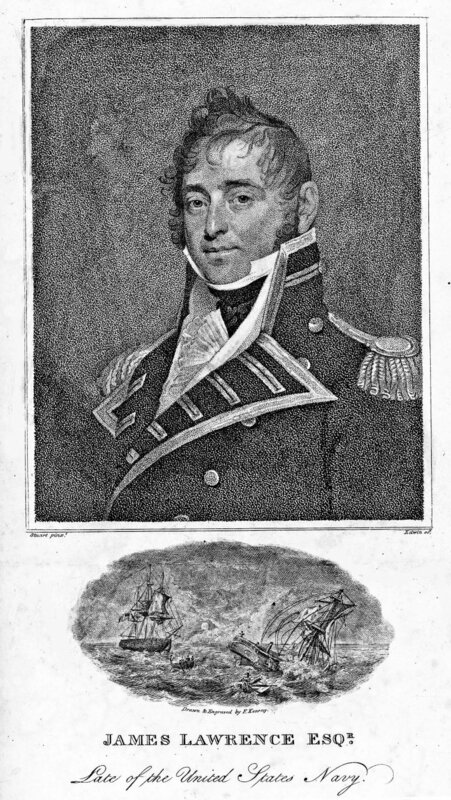 U.S.N.” (1774-1833) portrait by Gilbert Stuart (1755-1828), in the engraved 1813 version by David Edwin (1776-1841) for The Analectic Magazine, with a vignette of the U.S. Frigate Constitution and HMS Java, December 29, 1812, drawn and engraved by Francis Kearney (1785-1837). Huzzah! for Madison, huzzah! for union and America. The heavens would soon interpose. And light again the nation cheers. 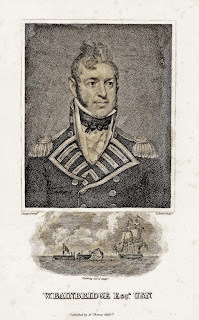 “Admiral Cockburne’s Expeditions” from the New-England Palladium, Boston, October 5, 1813. The burning of Washington, D.C., 1814. Being disturbed by the enemy, and having every person in the office, a small boy excepted, under arms, last Saturday passed without a publication of the WEEKLY REGISTER. We shall bring up the now two wanting numbers as fast as we can, without regard to particular days of publication, until we get into regularity of time, with our work. General Sir George Cockburn, painted by Sir William Beechey (1753-1839). In the background a burning Washington, D.C. 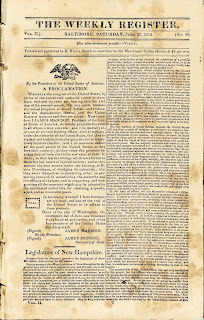 The Weekly Register, founded in 1811 and lasting until 1849, is now considered one of the most valuable sources for the history of the period. Its Quaker founder aimed for an impartial tone, free from electioneering, and the strident factional slant of most contemporary papers. 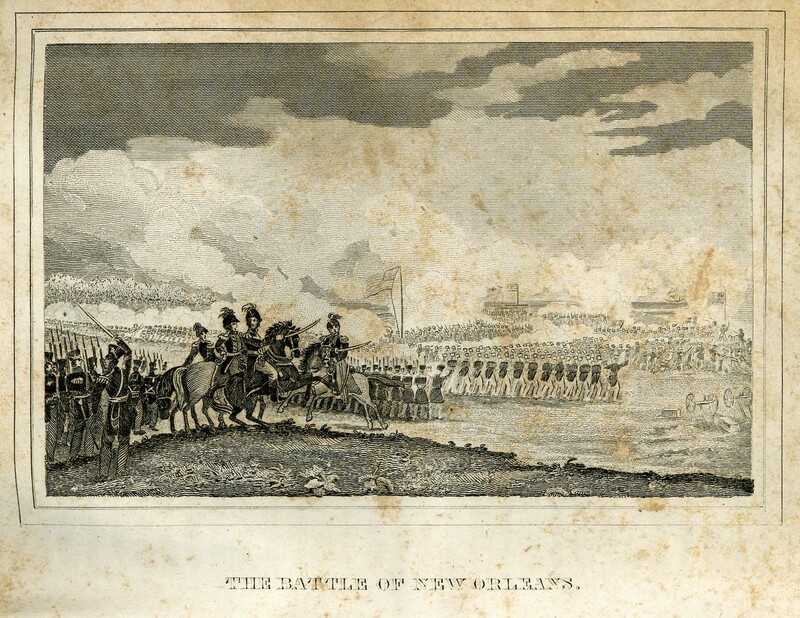 A crude engraving of the Battle of Chalmette, near New Orleans, 1815. Published in Biography of Andrew Jackson President of the United States by Philo A. Goodwin, Esq., printed in New York by W. Hart Towner in 1835. 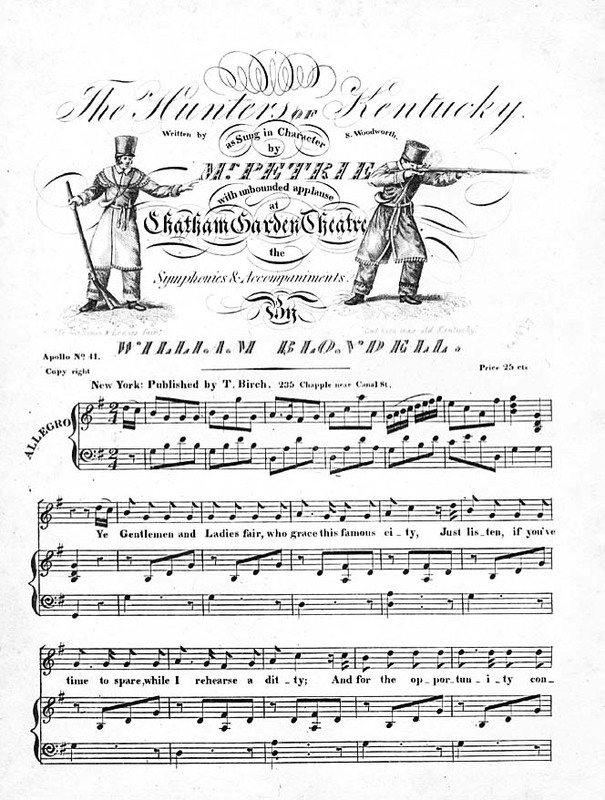 Early sheet music of “The Hunters of Kentucky,” celebrating Andrew Jackson’s victory at New Orleans. The editor would often do the legwork and personally write most of the paper’s content – the line between editorial opinion and news remained blurred (in other words, little different from today’s television news programming.) Some few editors were scandalmongers, but most attempted to maintain a moral high ground. 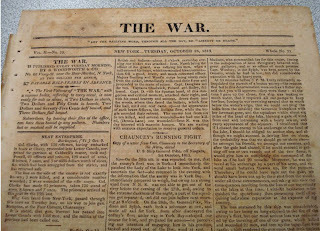 Recognizing the crucial nature of the conflict, New York publisher Samuel Woodworth (1784-1841) launched a paper called simply The War in June 1812. 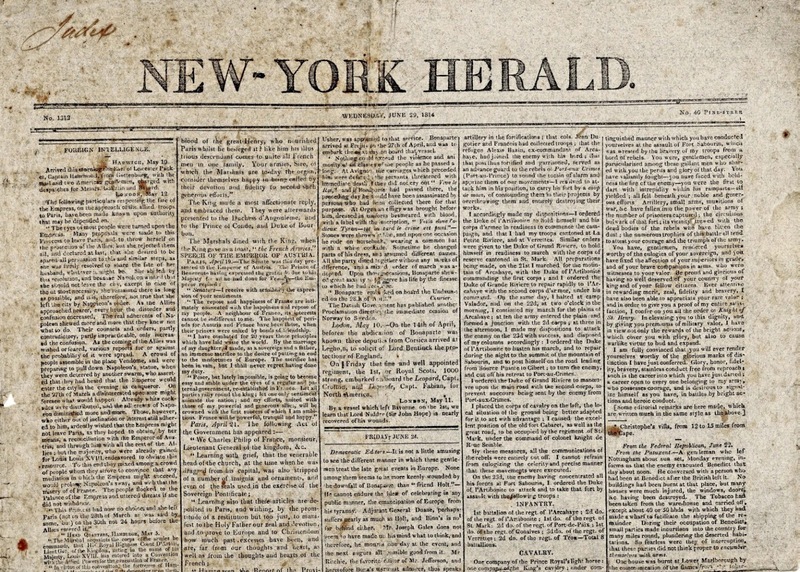 Its masthead proclaimed, “Let the Rallying Word, Throughout All the Day, be ‘Liberty or Death.’” The paper lasted until September 1814, when it succumbed to financial woes. 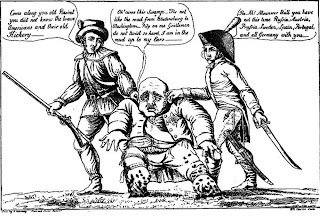 Cartoonist William Charles’ version of Jackson’s victory. 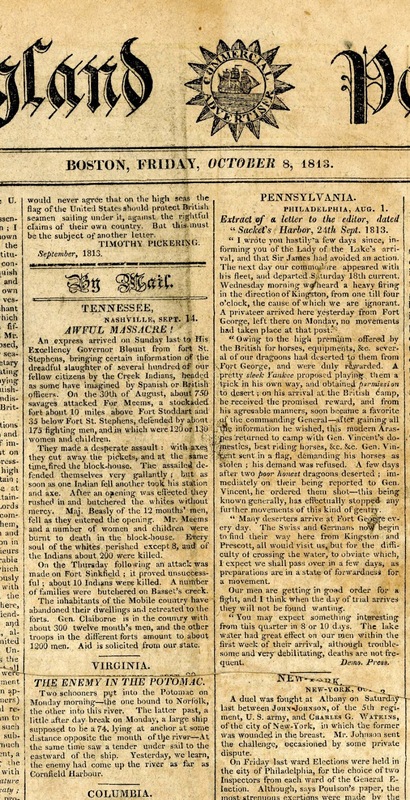 All transatlantic shipping was impaired by the war, particularly during the British blockade of Chesapeake Bay, yet a fair quantity of foreign publications reached journalists living in east coast port cities. Once these had been digested, printed and distributed as “Freshest Foreign Advices,” editors living inland could in turn clip and paste the same pieces at second and third hand. 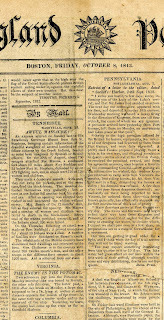 The normal practice was to cite the paper from which a story had been lifted, so we can often trace the progress of news as it was copied and recopied farther from the coast. Major items moved surprisingly fast along the extensive river systems and the few well-maintained post roads. 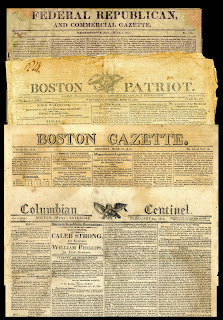 Representative American newspapers of the War of 1812. The war years saw the rise of a thriving magazine publishing industry. 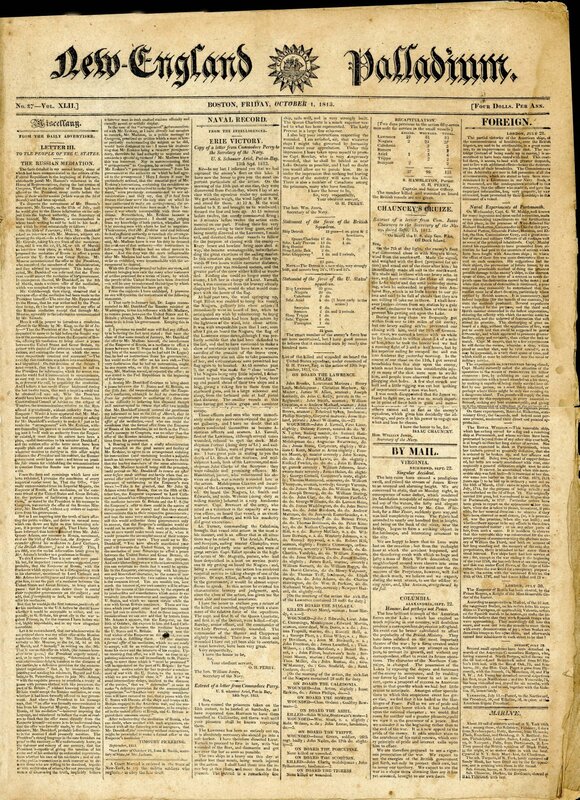 Over 400 magazines were launched during the 1810-20 decade, although only 59 survived for more than a few issues. 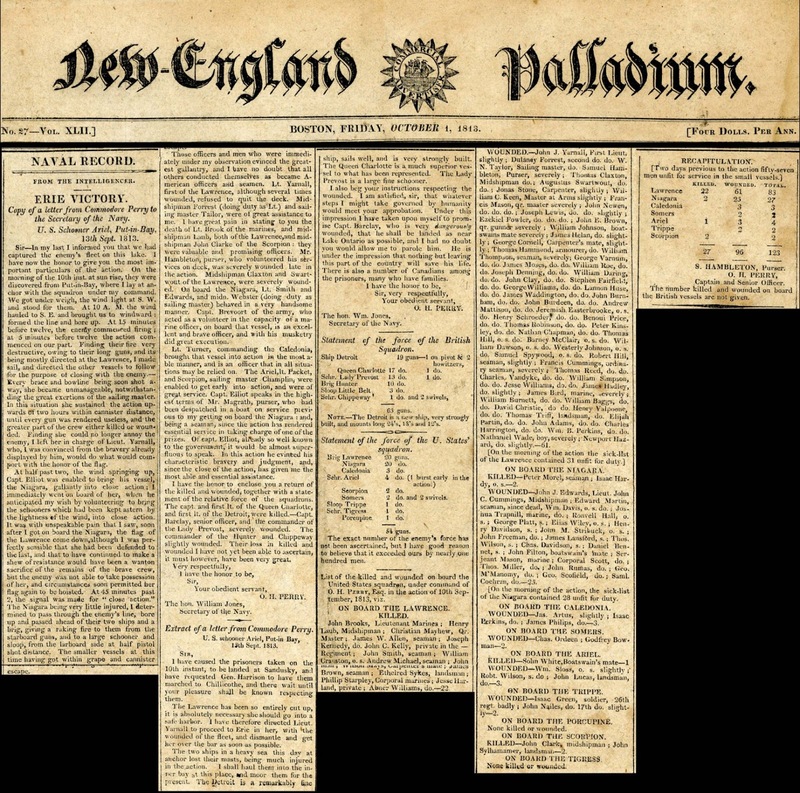 Since a “magazine” is synonymous with “storehouse,” editors likewise wielded scissors and paste pots to glean articles from the domestic weekly press and from English and European publications. 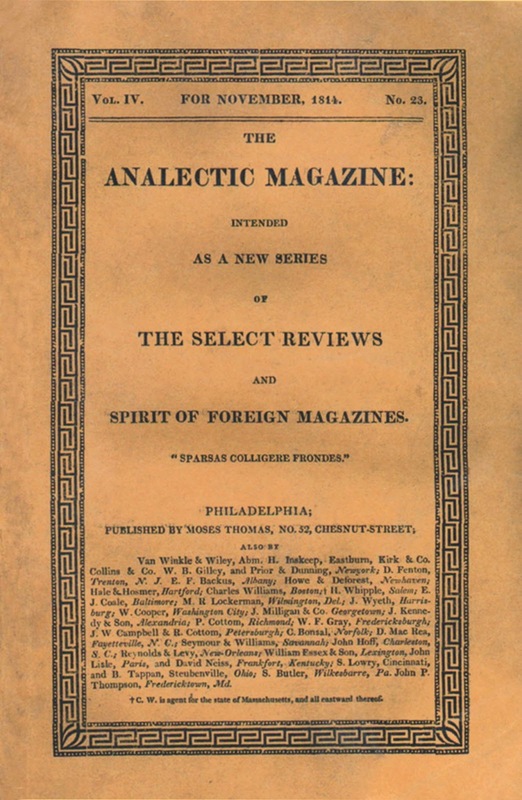 One of the best known was The Analectic Magazine, published in Philadelphia by Moses Thomas from 1813 to 1820, and edited for its first two years by Washington Irving. 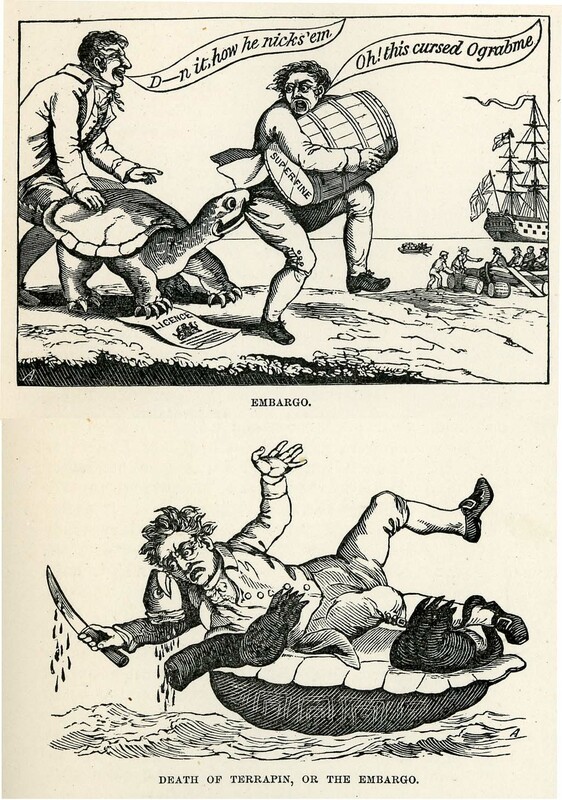 Cartoons by William Charles (1776-1820) satirizing the embargo against British goods. 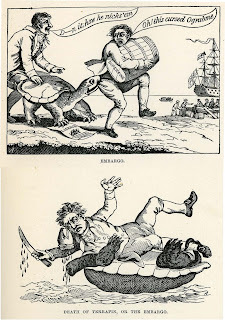 The monstrous terrapin “O-Grab-Me” is shown nipping a smuggler and finally being repealed. The woodcuts were done by Benson John Lossing (1813-91). 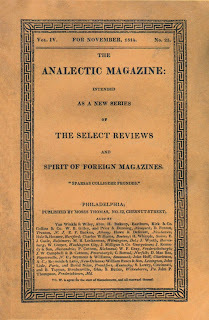 The Analectic Magazine billed itself as a repository containing the “spirit of the foreign journals,” (i.e. 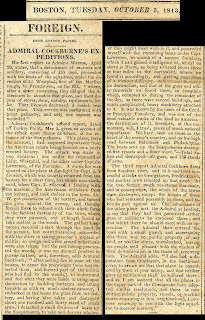 : scissors and paste) but it also served as a “military and naval chronicle” and published outstanding articles and stipple engravings on wartime subjects. 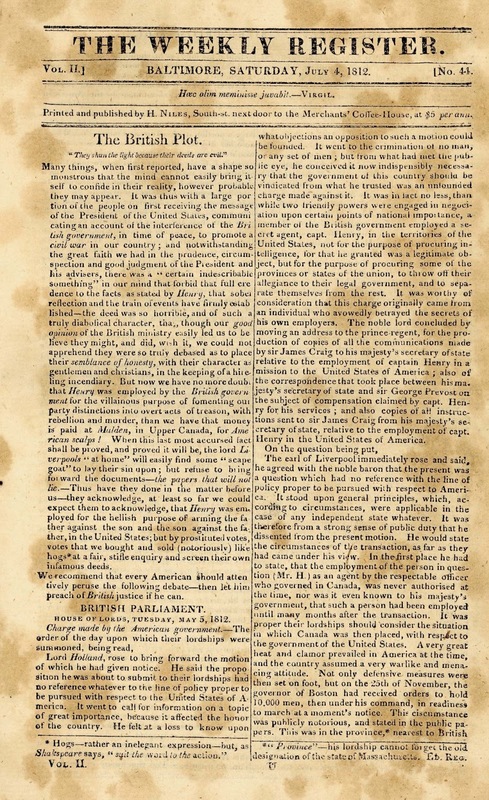 “The Defense of Fort M’Henry,” or “Star Spangled Banner” made its magazine debut in the issue for November 1814. 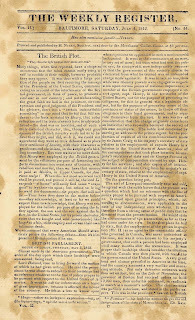 Francis Scott Key’s poem, set to John Stafford Smith’s melody for Ralph Tomlinson’s lyric, “To Anacreon in Heaven,” had first been published in the Baltimore weekly papers and as a flimsy broadside, but the Analectic broadcast it across the country, where it reappeared in countless journals. Hezekiah Niles (1777-1839) editor and publisher of The Weekly Register. Read Volume IV (July-December 1814) of The Analectic Magazine HERE. 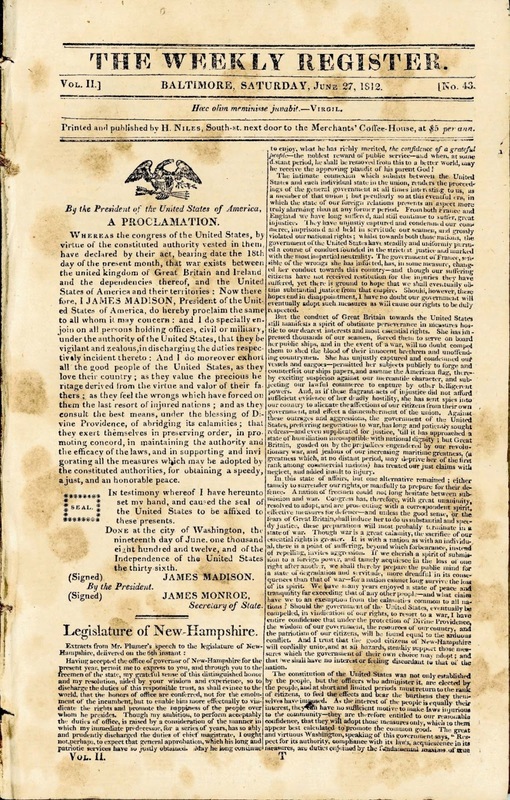 The Weekly Register, June 27, 1812, containing James Madison’s proclamation of war. American political satire and engraved cartoons never approached the volume and variety or reached the artistic heights of the works of George Cruikshank, Thomas Rowlandson and James Gillray in England, yet a Scottish-born engraver named William Charles (1776-1820), who emigrated to America around 1806, produced some memorable images in the savage style of Rowlandson. 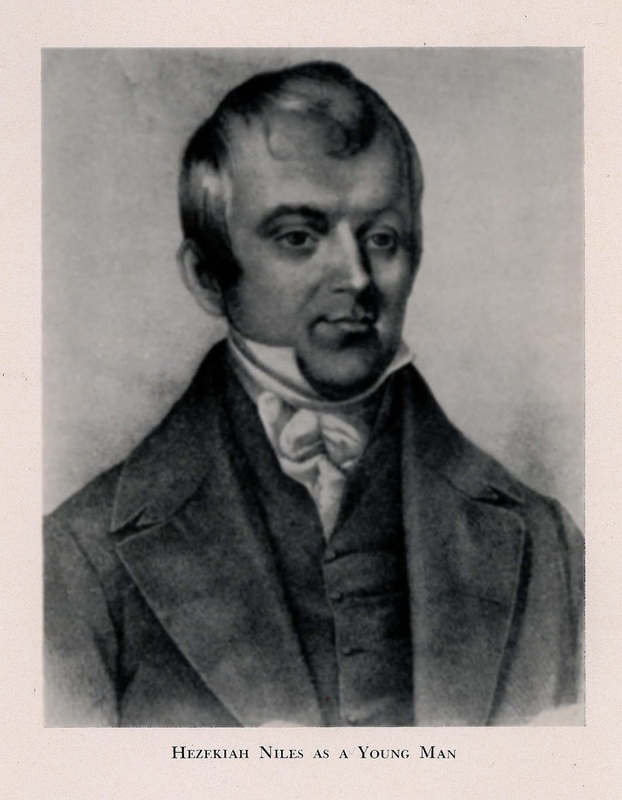 He also illustrated several books and magazines published in New York and Philadelphia. The book trade continued to expand along with the constant growth of periodicals. 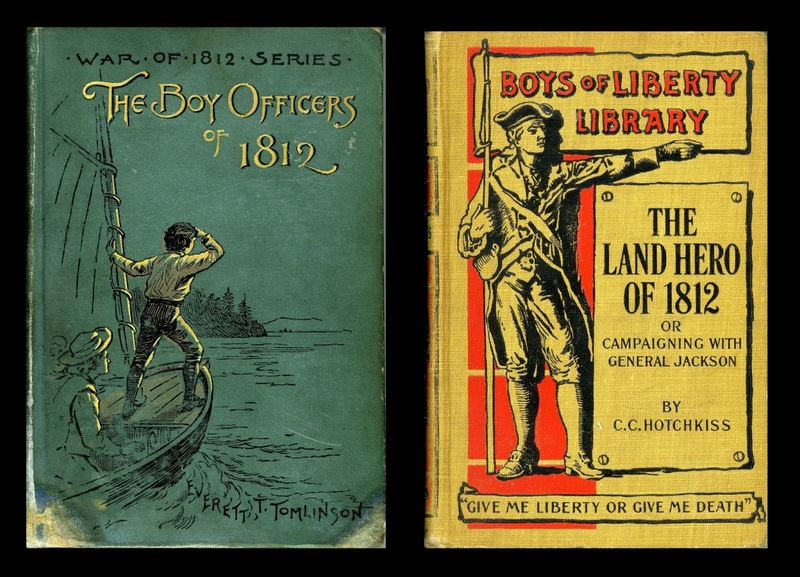 Many volumes and pamphlets dealing specifically with current political and military affairs were printed during and immediately after the war. To train the common militia, drill manuals for infantry, artillery and cavalry were in constant demand. Typical of these is a postwar manual, published by Paraclete Potter (1780-1858) of Poughkeepsie, NY, in 1824, adapted from the Infantry Exercise then in use by the regular army. Illustrated with crude plates, it outlines the complex procedures for handling, loading and firing the .69 caliber muzzle-loading smoothbore muskets of the day. In the decade after the war, collections of state papers, biographies, popular histories and war reminiscences appeared with regularity. 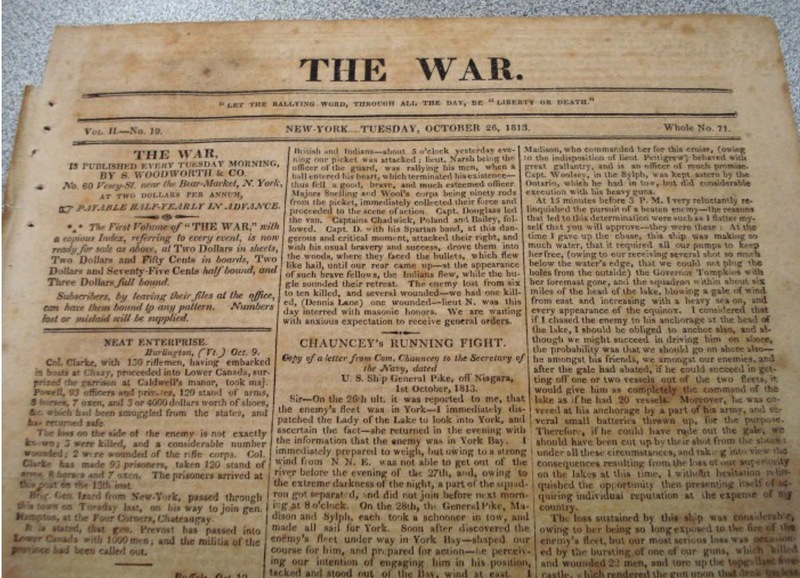 The War, October 26, 1813. 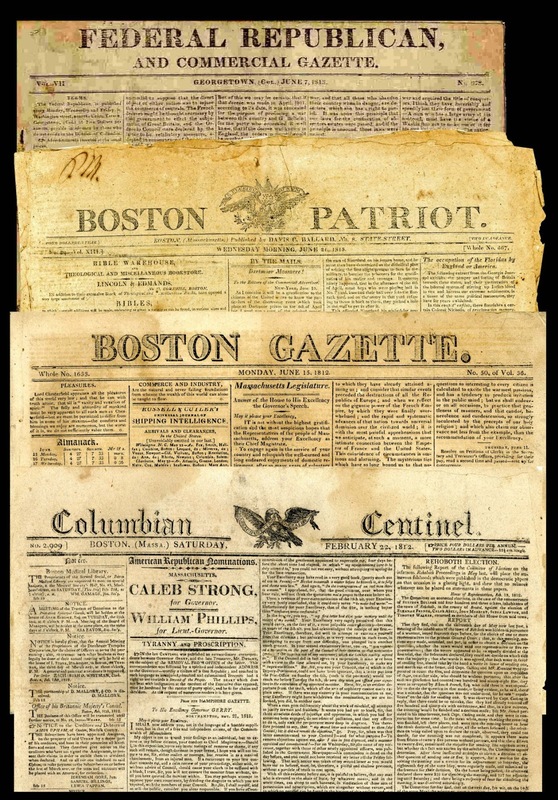 U.S. newspapers, magazines, books and pamphlets from the early Federal period were produced, and have survived, in greater quantities than printed matter from the Colonial and Revolutionary eras. Each example is a time capsule of news, opinion, literary efforts and advertising. The ads are a cross section of human activities: goods for sale, shipping arrivals and departures, militia musters, runaway slaves and apprentices, lost and found, sales of livestock and real estate, bankruptcy and other legal notices, births, marriages and deaths and so on. The New-England Palladium, Boston, October 1, 1813, containing a full account of Perry’s victory on Lake Erie. 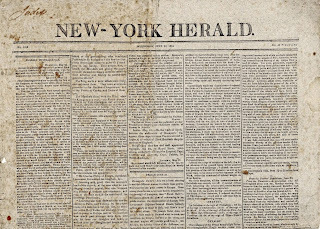 The New-York Herald, June 29, 1814, containing European news, following the abdication and exile of Napoleon in April. Wrapper of The Analectic Magazine, November 1814. 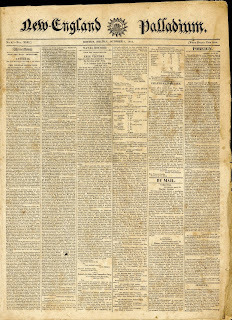 This issue contained the first magazine appearance of Francis Scott Key’s poem. Despite its shameful atrocities on both sides, the “second war” with Great Britain allowed both the United States and Canada to develop according to their individual destinies as neighbors, instead of predator and prey. English mills and hatters soon grew dependent upon U.S. cotton and beaver pelts, and a vigorous transatlantic commerce ensued, lasting until the Civil War. Continue to our Part II — Picture Gallery HERE.